You can now find the latest breeding information for every weaver species on PHOWN (Photos of Weaver Nests). This means that you can: (i) look up published info here, and (ii) compare the published info with that in PHOWN, especially data on colony sizes and breeding seasonality. There is already improved data in PHOWN on colony sizes in some weavers. 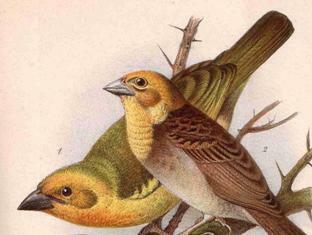 For Southern Brown-throated Weaver, for instance, the Handbook of the Birds of the World, Vol. 15 (HBW) gives the following: "Colonial, with up to 300 nests together" and data currently in PHOWN gives colony size as 2-15 nests, mean 9.3 (n=3). Similarly, for the Lesser Masked Weaver, HBW says: "Colonial, up to 60 nests at a site", while PHOWN provides much improved information: 5-65 nests, mean 22.3, for 6 colonies. Again, for Yellow Weaver, HBW gives "Colonial; in reedbeds seldom more than 50 nests together, but 150 nests in tamarind tree (Tamarindus) on Zanzibar" while PHOWN provides the following information: 3-64 nests, mean 27.3, for 18 colonies. No species has enough data yet - more records are needed for all species to study variation in colony size geographically and in different years. Records from long ago can be submitted if you have a photo, GPS location, and date (nest count and other data is preferable but if you don't have this, still submit the record). To browse records and find out about submitting records, read here. On 25 June Southern Masked Weaver BD13864 was recaptured at Frogmore, Cape Town, in some reeds just north of Zandvlei. Although it is mid winter, this bird was virtually in full breeding plumage with a few yellow feathers left to moult on the mask. The recapture was special as it had been ringed as a chick on 13/08/2009 at Westlake, less than 1 km from the recapture site. It was in a nest in reeds and the nest had two chicks which were both well feathered. Chicks were ringed in 2007 for a study on natal dispersal in weavers. Male Southern Masked Weavers start breeding at age 2 years (females can start at age 1 year). No nests were found near the ringing site, indicating that BD13864 has not started his first colony yet, but may do so soon. 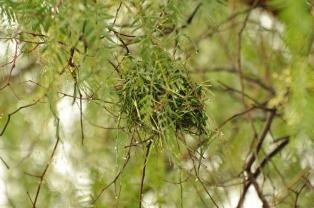 The first few weaver nests are being built at some sites in Cape Town - see PHOWN (Photos of Weaver Nests). Africa's feathered locust is the Red-billed Quelea. Compared with SABAP1, it is adding range, and it is apparently multiplying in numbers. All the BLUE quarter degree grid cells represent places where it was not recorded in SABAP1, but has been recorded in SABAP2. The range expansion westwards, especially into the winter-rainfall region of the Western Cape is striking. The overall impression of the map is GREEN, indicating that reporting rates for the Red-billed Quelea are higher in SABAP2 than they were in SABAP1 (and in many grid cells throughout the range the reporting rates are substantially higher now). 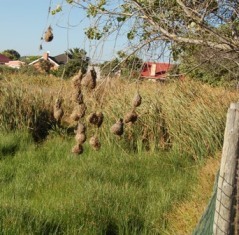 The closest quelea breeding colony to Cape Town was found near Worcester in April 2009 - see here. Recent records in the winter rainfall area can be found here. 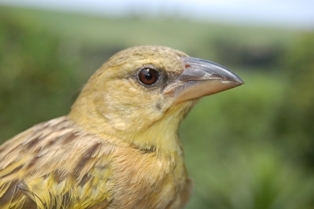 Thick-billed Weaver 4H16349 was ringed as an adult female by Mark Brown on 2001-03-19 at the University of KwaZulu-Natal, Pietermaritzburg. It has been recaptured at the same site seven times, the last time being on 2011-05-25, making it at least 10 years 2 months 6 days old. A second adult female, 4H16364, was retrapped on the same day, having being ringed 6 months later than 4H16349, making it the second oldest Thick-billed Weaver in SAFRINGs database. Mark says: "these two birds were netted by Minke Witteveen and Dominoc Rollinson, two trainee ringers, 40m from my office where I can keep an eye on them! We put all the swept up seed from the UKZN Aviaries out for the birds and are visited mostly by Thickbilled Weavers, Laughing Doves, Redeyed Doves and Greyheaded Sparrows." This month a record of a Village Weaver Ploceus cucullatus was accepted for Egypt. The bird was seen at Abu Simbel (near southern border of Egypt), Lake Nasser, on 2006-05-01, see here and choose 'June 2011'. The origin of the weaver is unknown and the closest normal distribution is over 900 km away in Sudan. One other weaver species occurs in Egypt: the Streaked Weaver Ploceus manyar (see full species list here). The Streaked Weaver was introduced to the Nile Delta in the 1970s and appears to be resident. 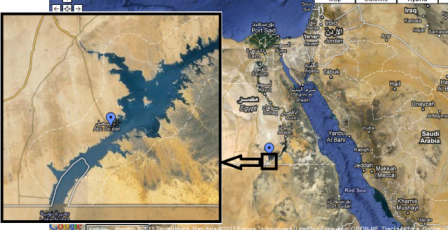 Map showing Abu Simbel in Egypt. The Sasol birds and birding fair 2011 runs from 28-29 May at the Johannesburg Zoo. There will stalls, including a bird ringing stall (SAFRING), and talks including one on weaver bird demography entitled "Weaving a story with Citizen Science" (old title: "Weaver demography relating to several subjects: climate change, wetlands, citizen science and ringing"). For most weavers the basic breeding factors are known, i.e. breeding season, clutch size, incubation and fledgling periods. One of the least known breeding factors, and yet one of the easiest to collect, is colony size. The reason for this is that colony sizes vary, particularly in polygnous species. 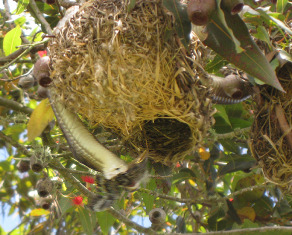 Colony size is important as a determinant of breeding success; males with more nests attract more females and have a higher breeding success - there is evidence for this in at least Southern Red Bishops, Cape Weavers, Village Weavers and Southern Masked Weavers, and this probably holds true for most polygnous weavers. Citizen scientists can help provide data on colony sizes by photographing weaver nests and submitting the records to PHOWN (Photos of Weaver Nests). PHOWN already has data on colony sizes for 33 weaver species: see here, and some of this data is new. 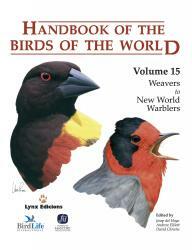 For instance, the Handbook of the Birds of the World, Vol. 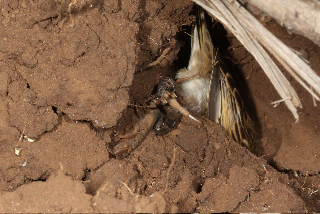 15 (HBW) is the most recently published summary of weaver information and it does not have any data on colony sizes for the White-browed Sparrow-Weaver. Data currently in PHOWN gives colony size for this species as 1-35 nests, mean 12.8 (n=60). 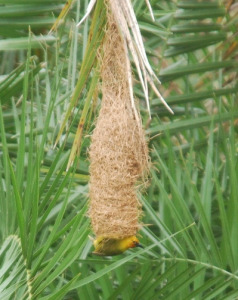 Similarly, for the Lesser Masked Weaver, HBW says: "Colonial, up to 60 nests at a site", while PHOWN provides much improved information: 5-65 nests, mean 22.3, for 6 colonies. No species has enough data - more is needed to study variation in colony size geographically and in different years. Many weavers are monogamous and solitary but records of these are still valuable for studying other aspects of weaver breeding biology. To find out more about submitting records, read here. Records from long ago can be submitted if you have a photo, gps location, and date (nest count and other data is preferred but optional). The most southerly Sociable Weaver colony known was recorded by Richard Brooke 21 years ago while atlasing for SABAP1. In a trip to the Williston area, Northern Cape, Barry and Sue Schultz and I found this very colony. It was no longer active but a Sociable Weaver nest mass was found a few hundred metres closer to the farm house. 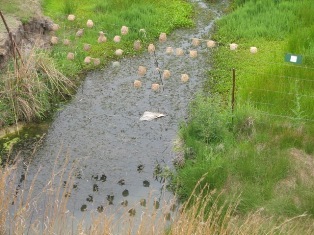 This nest mass was active, with adults feeding chicks. A few days later we returned and ringed 71 adults and 74 juveniles at this colony. Not all birds were caught, and the colony consisted of an estimated 200 birds. 60 nest chambers were counted (VM 748). Unfortunately several birds were dead, hanging from threads that they had built into the nest. This was found subsequently at other colonies as well - no ringing has taken place here previously (SAFRING database) and the birds were caught mostly on their toes. The Williston area was searched for other colonies, and farmers were interviewed. Colonies on sheds were found, but none further south. Read more here. 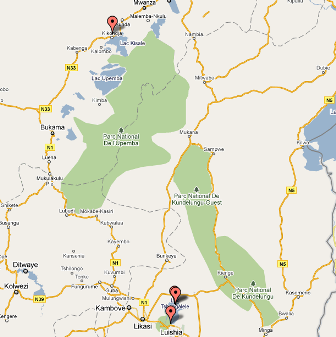 The first records from Ethiopia have been added to PHOWN. The 33 records were submitted by Arnia Van Vuuren, S Swarts and Abiye Dagne. Arnia has already submitted over 100 PHOWN records, mostly from South Africa. Several species are included in PHOWN for the first time: White-headed Buffalo Weaver (3 records), Chestnut-crowned Sparrow-Weaver (1), Ruppell's Weaver (4), Speke's Weaver (1), Grey-capped Social Weaver (1) and Black-capped Social Weaver (2). In addition, there are records of Red-billed Buffalo-Weaver (1), White-browed Sparrow-Weaver (17), Red-headed Weaver (2) and Village Weaver (1). To see the Ethiopian PHOWN records, see here. 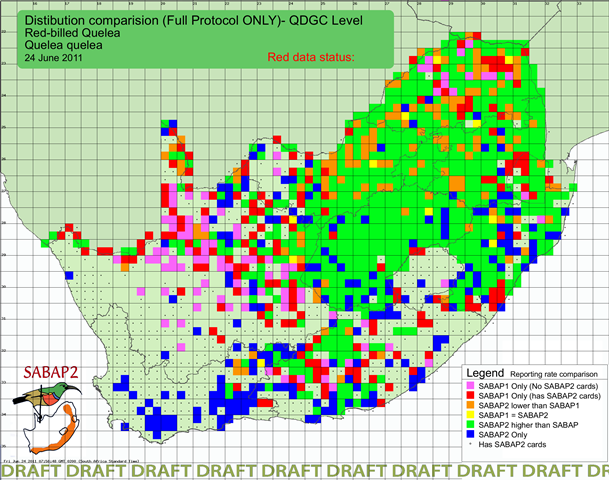 The author compares reporting rates of birds from the first (1987-91) and second (2007-) Southern African Bird Atlas Projects (SABAP1 & 2) for the Nelspruit quarter degree grid cell (2530BD) in Mpumalanga. At the time of writing 215 cards had been submitted for this grid cell for both projects. Of the 15 Ploceidae species, all but three show an increase in reporting rate, often a dramatic increase. 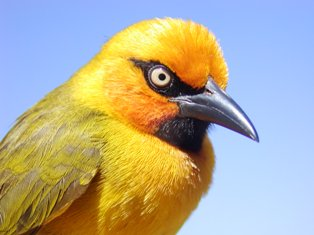 The exceptions are: Yellow-crowned and Yellow Bishops have not been recorded during SABAP2, and the Red-headed Weaver has a lower reporting rate in SABAP2. The author notes that generally wetland and grassland species show significantly lower reporting rates now, and forest and woodland birds are reflecting large increases in reporting rates in SABAP2. While many of the weavers use wetlands, they are adaptable and can cope with rivers that are overgrown with weeds and exotics, as well as using wooded areas and gardens. To read the paper, click on the journal reference above. The weaver with the highest reporting rate is Spectacled Weaver (93%, SABAP2), placing it ninth of the most common birds in Nelspruit, where the Dark-capped Bulbul is first (99%). 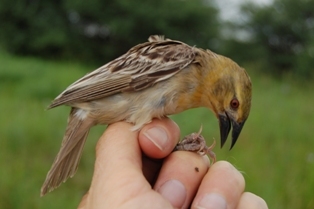 Nine of the Nelspruit weaver species were ringed in a recent visit - see here. 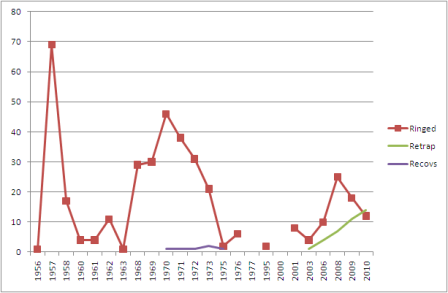 The Thick-billed Weaver arrived in Gauteng in the early 1960s from Mpumalanga, and slowly increased in numbers. Johannesburg and Pretoria have many parks and wetlands with reed beds which provide ideal nesting sites for this species. In the non-breeding season it feeds on seeds, fruits and insects. In the original range, these were mainly obtained in forests, but the gardens of Gauteng provide a suitable alternative habitat with adequate food. The SABAP2 range-change map shows that in recent years the population has increased dramatically in Johannesburg and Pretoria and that this species is expanding its range beyond Gauteng. The range change observed for this species seems to be mostly accounted for by changes to the habitat (rather than to climate change). There are several PHOWN records for this species, including records in Gauteng. This is part of the range change map between SABAP1 and SABAP2 for the Thick-billed Weaver. This map is centred on Gauteng, and includes some of the northern Free State, eastern North-West Province, southern Limpopo and western Mpumalanga! The top number in a quarter degree grid cell (QDGC) is the reporting rate in SABAP1, the bottom number is the SABAP2 reporting rate. Thick-billed Weavers were recorded in the GREEN, ORANGE and RED QDGCs in SABAP1. The BLUE QDGCs represent new range in SABAP2. In this region, there are seven RED QGDCs where Thick-billed Weavers were recorded in SABAP1 but not yet in SABAP2. There are three ORANGE QDGCs where the reporting rate is now slightly lower than in SABAP1. In contrast to these figures, there are 20 GREEN QDGCs where the reporting rate has increased, and in many of these the increase has been substantial. This is especially true of the eight GREEN QDGCs in Gauteng. In one of them the reporting rate is approaching 50%! In much of the new range, in BLUE, the reporting rates exceed 10%. Today some 117 weaver bird species are recognised. However, over 600 weaver taxa have been described, either as full species or as sub-species. Many of these taxa have been found to not be valid but having been described, they provide published records of specimens. These records may provide important historical records of species occurence. A new feature on the Weaver Watch webpages is giving a weaver type on the day that it was collected. The date of this news item is 31 March, and on this day (in 1908) a weaver was collected that was later described as a new species: Ploceus graueri. This is no longer considered a separate species but it is a Village Weaver. 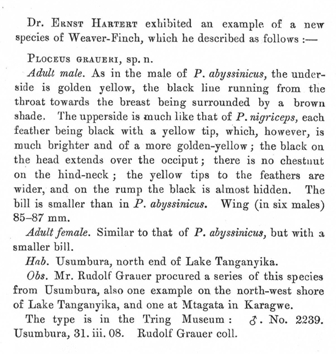 This particular taxon was collected by Mr Rudolf Grauer at Usumbura, on the north end of Lake Tanganyika, as a series of several individuals. It was described 3 years later by Ernst Hartert, curator of Tring in England. Ernst named it after the collector. A box on the weaver Watch home page will be updated daily, showing a weaver type that was collected on that day - the box will show the date of collection, the original name and the current species that the taxon belongs to. 247 days of the year are covered, ie. on 118 days no weaver types are known to have been collected. Abstract.The immunocompetence handicap hypothesis (ICHH) posits that the hormone testosterone mediates a trade-off between investment in reproduction and immunological condition. In this study, we tested the ICHH in the Red Bishop Euplectes orix, a polygynous weaverbird. Males of this strongly sexually dimorphic species show an elaborate courtship display to attract females and compete aggressively with other males for nesting sites in breeding colonies. 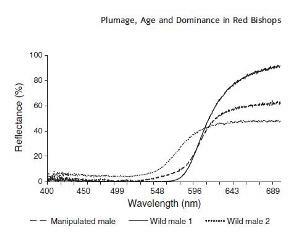 We experimentally elevated testosterone levels in breeding male Red Bishops kept in an aviary with a subcutaneous implantation of testosterone-releasing pellets. We then compared behaviour, development of territory size and immunological condition (as assessed through a white blood cell count) of the experimental group with a control group treated with placebos. In addition, we measured the primary and secondary response to phytohaemagglutinin (PHA) to investigate the effect of testosterone on both innate and acquired immunity. Males with elevated levels of testosterone enlarged their territories and conducted more courtship behaviour, while showing a decrease in health, expressed by an increased heterophil / lymphocyte ratio compared with the control group. Males of the control group showed an increase of the secondary response to PHA, as expected under the assumption that repeated exposure to an antigen enhanced the immune response due to acquired immunity. However, males with experimentally increased testosterone levels did not show such an enhanced immune response in the secondary PHA test (although sample size and power of the statistical tests were low), indicating that testosterone treatment might directly or indirectly suppress some component of the acquired immune response. T. Farkas (1966. The birds of Barberspan. Ostrich Suppl. 6:463-491) counted 24 White-browed Sparrow-weaver nests at Barberspan in 1963 – 1964. 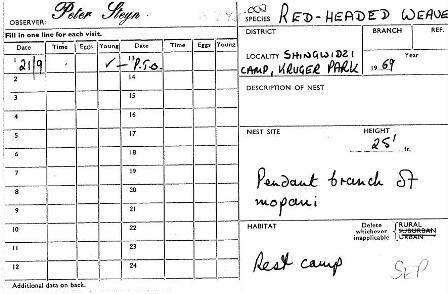 Peter Turner counted c. 20 nests in a couple of acacias on 25 July 1964 (Nest Record Cards 780.068 and 780.071); two nests contained eggs. There were no further nest counts at Barberspan until March 2010 during a SAFRING ringing workshop. Two species have PHOWN records as well as Nest Record Cards that have been digitised, see Chestnut Weaver and Southern Brown-throated Weaver. Click on a thumb-nail to see details of an individual record. You can choose any species to see the records available. Thanks to all participants for your records! The author observed two Gabar Goshawks attacking Red-headed Weaver nests in Maun, Botswana. The goshawks were driven away by Red-billed Buffalo weavers (also nesting here) and some rollers. The story previously appeared here. For PHOWN (Photos of Weaver Nests) records of Red-headed Weaver see here. Abstract. Aim Apparent anthropogenic warming has been underway in South Africa for several decades, a period over which significant range shifts have been observed in some indigenous bird species. We asked whether these range shifts by birds are clearly consistent with either climate change or land use change being the primary driver. Methods We categorized recent range changes among 408 South African terrestrial bird species and, using generalized linear mixed models, analysed ecological attributes of those species that have and have not changed their ranges. Results Fifty-six of the 408 taxa studied have undergone significant range shifts. Most extended their ranges towards the south (towards cooler latitudes, consistent with climate-change drivers) or west (towards drier and warmer habitats, inconsistent with climate drivers but consistent with land use drivers); very few moved east or north. Both southward and westward movers were habitat generalists. Furthermore, southward movers were mobile taxa (migrants and nomads), whereas westward movers were associated with human-modified elements in the landscape, such as croplands, plantations or buildings. Main conclusions The results suggest that both land use changes and climate change may simultaneously be influencing dynamic range shifts by South African birds, but separating the relative strengths of these two drivers is challenging, not least because both are operating concurrently and may influence some species simultaneously. Those species that respond to land use change by contracting their ranges are likely to be among the species that will be most impacted by climate change if land use practices with negative impacts are occurring in areas anticipated to become climatic refugia for these species. This highlights a pressing need to develop dynamic models of species’ potential range shifts and changing abundances that incorporate population and dispersal processes, as well as ecological processes that influence habitat suitability. 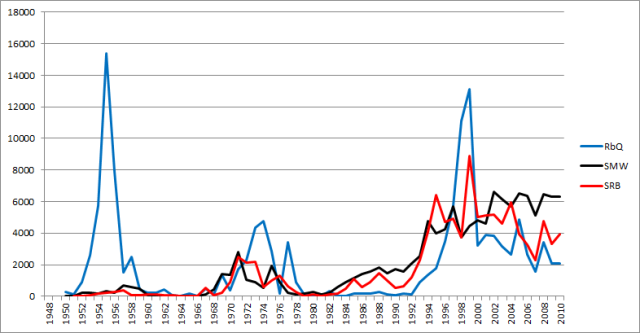 Between the 1970s and the 1990s three weaver species underwent shifts in their southward range limits (White-browed Sparrow-Weaver, Sociable Weaver and Scaly-feathered Finch) while two weaver species underwent shifts in their westward range limits (Thick-billed Weaver and Red-billed Quelea). Read more here about the quelea range expansion (also map on right). On 14 December 2010 Shaun McCartney photographed a Village Weaver of the northern subspecies at Welgevonden Main Gate (-24.203333,27.900278). Shaun writes: "It was feeding with about a dozen of the local variety. We observed it for the length of 2 x Windhoek lagers and 1x Jamieson- It was late afternoon (between 17h30 and 19h00). 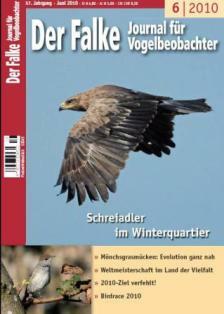 I was in the company of Gerhard Lorist, an accomplished Birder, who noticed the difference between the two. The following day (and on subsequent days) Gerhard returned to try and photograph the bird but it was AWOL." This record adds to the growing number of sightings of Ploceus cucullatus nigriceps. For more records with photos, see Raijmakers 2010 and Brooks 2010. To read more about the two races see here. 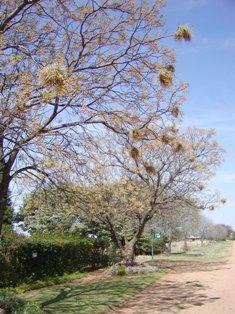 The Chestnut Weaver breeds erratically in Namibia, mostly between December and May. A colony was found 2 weeks ago by Gudrun Middendorff - the colony was some 25 km north of Windhoek, and males and females were seen. On 5 February Gudrun, Neil Thomson and I put nets up to catch the breeding birds. A total of 37 females, all with distinct brood patches, were caught and ringed. No males were present in line with males deserting colonies soon after egg laying or hatching of the chicks. Several low nests were reached by ladder and 4 active nests contained 3 small chicks each. A fifth breeding nest contained 2 white Red-headed Finch eggs. Other low nests were unlined. 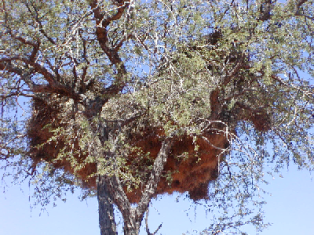 This colony was submitted to PHOWN (Photos of Weaver Nests) - see here. Thanks to neil and Gudrun for hosting me! There are 38 Nest Record Cards at the ADU for this species, and these have been converted into a format for PHOWN by Heidemarie Swanepoel. These records include the colony details and in place of photos there are images of the actual cards. The coordinates are approximate as they were not provided on the original cards. The cards, and normal Virtual Museum records, may be viewed here. Click on an image to see the details for that record, or scroll down to see a map for all the Chestnut Weaver breeding records. Abstract. Understanding the evolution of cooperation requires determining the costs and benefits of cooperative behaviour. In cooperative breeders, where nonbreeding individuals assist in raising offspring, these 'helpers' are expected to increase the fitness of breeders and hence empirical research has focused on the effect they have on reproductive output and breeder survival. However, the effects of helpers during the postfledging period are poorly known because of the difficulty of tracking fledglings in the wild. Helper presence might be beneficial for fledglings, for example through continuous food delivery or increased predator vigilance, but potential competition between helpers and fledglings, or changes in investment of parents assisted by helpers, could counteract these positive effects and have a negative influence on postfledging survival probabilities or promote dispersal. We investigated the survival of juvenile sociable weavers, Philetairus socius, raised in pairs alone versus pairs with helpers by using capture-mark-recapture methods to control for individual detectability in survival estimation. We found that local survival in the first year was reduced in young raised by groups versus those raised by pairs. This may reflect either higher mortality or emigration of juveniles raised in groups. Hence, our study reveals significant postfledging effects of cooperative breeding that have not been reported previously and that need to be investigated in studies addressing the evolution of cooperative breeding. 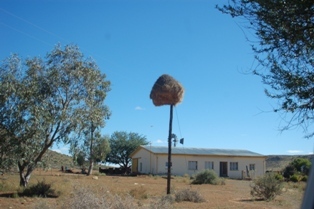 The Sociable Weavers were studied on Benfontein Game Farm near Kimberley, Northern Cape, and formed the basis of many studies. The number of chambers in many of the study nests were counted over several years and Rita has kindly provided these records for PHOWN (Photos of Weaver Nests), without photos however. These records may be viewed here - zoom in on the map in the vicinity of Kimberley. 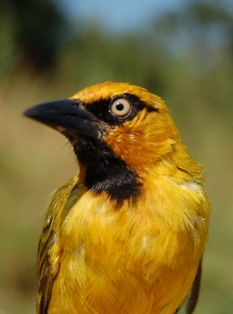 The southern race of the Chestnut Weaver occurs in Namibia, Botswana and Angola. Madel Whittington reported the first record of this species in Nossob in the Kgalagadi Transfrontier Park, and the record was posted to Sabirdnet on 11 January 2011. Bird ringer Ben Smit saw a male on 14 January 2011 and reports as follows: "This morning I was very surprised to find a male Chestnut Weaver in full breeding plumage building a nest in amongst a Southern Masked Weaver colony in a garden in Tswalu Kalahari Reserve, Northern Cape - well within the SA boundaries! The bird is currently having a hard time trying to get female mask weavers interested and fending off attacks by the Masked males!" A team of atlasers drove to Tswalu on the weekend and Tony Archer took a photo of this nest on 16 January to submit to PHOWN - see here. In Namibia the Chestnut Weaver is resident in parts and nomadic in other parts. The longest distances published for the species are of a bird ringed at Ngulia in Kenya and caught 213 km away 5 months later, and a bird in Namibia that moved 284 km. 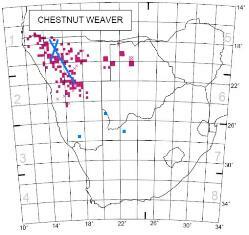 The closest known site for Chestnut Weavers to Nossob is 283 km (SABAP1 distribution) and from Tswalu it is 557 km. 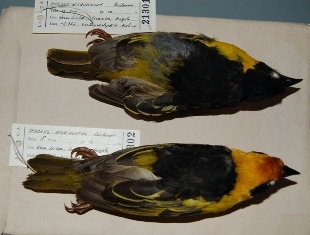 EXTRA VARIANTS OR FEMALES - Bocage's Weaver, Cape Weaver, Black-headed Weaver, Southern Masked Weaver, Vitelline Masked Weaver, Tanganyika Masked Weaver, Lufira Masked Weaver, Katanga Masked Weaver, Sao Tome Weaver, Príncipe Golden Weaver, Usambara Weaver, Loanga Weaver, Crested Malimbe, Red-headed Malimbe. Narrative of a name: red-headed or black-eared? The Red-headed Weaver was first described in 1839 by a French collector, Lafresnaye. He used the name Ploceus melanotis which was pre-occupied (already used) and thus is invalid, even though this particular name is no longer in use. The first valid scientific name to be used was by Sundevall who described several specimens collected by the Swedish big game hunter, Johan August Wahlberg, in November 1843 at Mohapoani (North West Province). All modern world checklists and the recent Handbook of Birds of the World Vol 15 use the correct name Anaplectes rubriceps. The name P. melanotis used in Roberts 7, and subsequent bird books using the species list in Roberts 7, is incorrect and authors of southern African bird books need to use the name Anaplectes rubriceps. 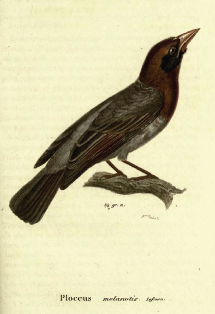 Left: The first published illustration of a Red-headed Weaver, by Lafresnaye (1839). Abstract. The marooning of populations on offshore islands can be used as a conservation technique for species threatened by introduced predators, but post-release breeding success is not always as high as expected. Following the release of Mauritius Fodies onto a partially restored islet of regenerating forest, supplementary food and control of nest parasites through the application of insecticide were used as precautionary measures to aid the establishment of a population. Nests were continuously monitored in the first three breeding seasons to inform future management decisions. The fodies built nests in taller, more mature vegetation and younger females were more likely to abandon nests before incubation started. 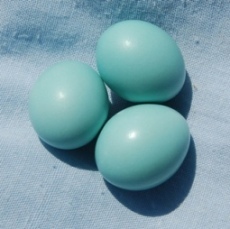 Eggs were laid between July and February and nests made earlier in the season were more likely to fledge young. Treating nests with the insecticide carbaryl increased the probability of success, but the distance of the nest from the supplementary feeding aviaries had no effect. The number of young per female decreased each breeding season and nesting success was similar to that of fodies using exotic plantation trees on the mainland between 2002 and 2006. Future research using population models and adaptive management could lead to the withdrawal or reduction of support measures for the released population and/or the harvest of individuals to establish populations on other offshore islands. 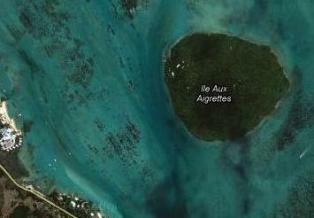 This paper describes how a population of Mauritius Fodies were established on Ile aux Aigrettes (left map: red marker, right map: enlarged) in Mauritius. A team of ringers visited Futululu, Bonamanzi, Twinstreams and Sappi Stanger to ring birds along Zululand's coast. One of the aims was to ring Southern Brown-throated Weavers Ploceus xanthopterus and a total of 44 were handled (including 3 chicks). 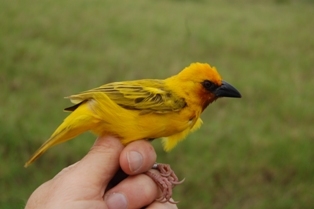 In addition, many Lesser Masked and Yellow Weavers were caught and a wide diversity of forest species. A total of 363 birds and 42 species were handled. To view some photos and a list of ringing totals, see here. A team of ringers will be visiting ringing sites near St Lucia from 14 to 19 November. One of the aims is to ring Southern Brown-throated Weavers Ploceus xanthopterus (left: female). 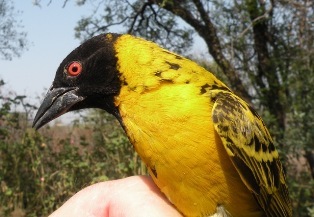 This species was first ringed in 1969 in southern Africa, by which time all other weaver species had been ringed. Only 429 have been caught in South Africa, although several thousand were ringed in Malawi (and by Mrs Dale Hanmer. Dale wrote an ageing and sexing guide for this species, based on her ringing experience. On 28 October 2010 Robben Island was surveyed for weaver colonies. 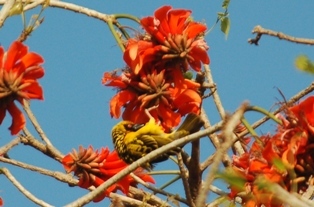 A total of 19 Cape Weaver colonies were found. Colony size varied from 2 to 54 nests, with an average of 15. The peak breeding season has passed and some of the colonies appeared deserted. Few nests were low enough to reach without ladders; of the nests that could be checked one contained 2 small chicks and another had 2 eggs. In some high nests chicks were heard calling. The colonies were all in exotic trees, mostly Eucalyptus, but also in Manatoka or Pinus. The records were submitted to PHOWN (Photos of Weaver Nests) and may be viewed here. A mammal, reptile and two butterfly records were also added to the ADU Virtual Museums. You can help with this project from home. Request some Nest Record Cards (NRCs) and these will be emailed to you as pdfs with an excel template into which the data needs to be filled in. For those with geographic skills, find the coordinates for the NRC. These records will ventually be added to the PHOWN database, providing historical records of weaver colonies, making this a very valuable resource. The authors have revised the 2003 edition to include 500 new images and improved maps. The major change in the weaver species is the inclusion of splits: Ploceus velatus split into velatus and vitellinus, and Ploceus reichardi into reichardi, ruweti and katangae. The plates are similar in both editions but there are 18 plates in the 2010 edition compared to 16 in 2003: one additional; plate is due to the taxonomic splits, and the other due to spacing out the widowbirds. A few additional pictures show an additional race for the Thick-billed Weaver and one additional race for the Black Bishop; there is an additional head for Viellot's Black Weaver showing eye colour variation. A new feature in the 2010 edition is having key identification features listed on the plates. The maps often show reduced ranges, not indicating range contractions but greater accuracy. A good example is the Red-billed Quelea where the 2003 edition showed it as occuring throughout the DRC whereas the new edition correctly shows it as occuring in the extreme south and north-east tips of the DRC. Range expansions are shown for the Rufous-tailed Weaver and Red-crowned Malimbe. Ranges in southern Africa are mostly identical in the two editions, being based on SABAP1, although the map for the Red-billed Quelea shows the recent range expansion into the Western Cape of South Africa. PHOWN reached the 100-record mark this week with a Cape Weaver colony submitted by Kevin Drummond-Hay, taken at De Grendal Wine Estate in the Western Cape, South Africa. Kevin counted 33 nests in the tree and took a photo with a cell phone. See more details of this record here. PHOWNs first newsletter is available here. Newsletters, highlighting interesting records, will be emailed at least quarterly but will also be available on the web. The Home page for PHOWN shows a gallery of the most recent photos - this gallery is automatically updated as new records are submitted and accepted. Google Maps takes part in PHOWN ! Google Maps streetview has recorded weaver colonies close to roads that they photographed. One example is of a Cape Weaver colony at Rondevlei, Cape Town. Find the colony here and zoom in at the marker until the streetview appears. You can view the colony from different angles. About 13 nests are visible, but unfortunately no date is available for this record. This particular colony has been monitored since 2006 and several times photos were taken. These photos may be viewed at the ADU Virtual Museum - click on "Projects" in the menu on the left, click on the project header "Photos of Weaver Nests", then enter 70 in the "Search" box at the top to see the first record of this colony - enter any number from 70 to 75 to see all the current records of this colony, spanning from 2006 to recently. To take part in PHOWN read here. How large are weaver colonies? Weaver colony sizes vary between species with solitary species having 1 or 2 nests and colonial species may have over 100 nests in one colony. Single-male colonies, like Southern Masked Weavers, typically have less than 10 nests but sometimes this may be larger especially if there are more males than the usual one. 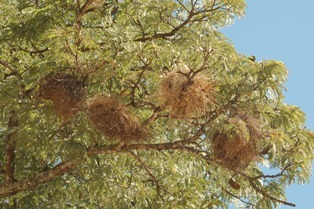 One result of PHOWN (Photos of weaver nests) project is having a nest count per colony. To see up-to-date minimum, average and maximum colony sizes for records submitted to PHOWN click here. 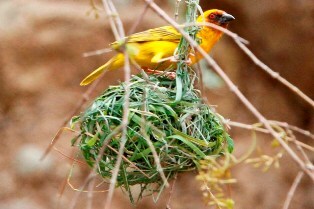 While birding, you can look out for weaver colonies and contribute photos with nest counts to the ADU Virtual Museum. As soon as your record is accepted, the average colony sizes will be automatically updated. To take part read here. PHOWN (Photos of Weaver Nests) has started off well with 42 records submitted within the first week of the project. There are records for 20 weaver species. Most records are from South Africa, 3 from Namibia and 3 from Rwanda. The most northerly record is of a Vieillot's Black Weaver Ploceus nigerrimus, a colony of 6 nests in Rwanda, recorded by Claassen Marcell. You can view submissions (without being registered) by going here. There are different search possibilities - explore these yourself! To take part read here. 2) recording breeding females and males in full breeding plumage will allow these 2 groups to be analysed in more detail - this is not possible with SAFRING data. In June Neil Thompson, ringing weavers and other birds in his Windhoek garden, caught 72 Southern Masked Weavers and Southern Red Bishops but as many 18 of these were recaptures. This changed the recapture rate for the whole project up from 9.1% to 9.4%. 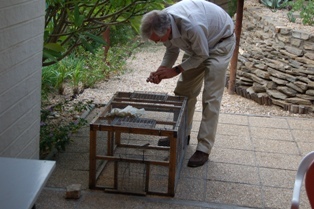 Neil uses mostly walk-in traps to catch the birds. Tanja is a student at the Nelson Mandela Metropolitan University who has an M.Sc. project on thermal tolerances of Southern Red Bishops. Tanja will capture bishops for metabolic rate measurements in two different locations: one with a mild coastal climate (Port Elizabeth) and the other location inland where seasonal and daily temperatures are extreme (Barkly East). Bishops in Barkly East will be captured between 22 July - 31 July 2010 with help from ringers Pat Cochran and Graham Grieve and trainees Liaan Minnie and Ryan Wasserman. Albert Schultz will help capture bishops in Port Elizabeth. "I went out ringing at one of my usual sites this weekend which is in a reed bed which gives me loads of Cape Weaver, Red Bishops and a numbers of other common reed bed species. I've been ringing there quite frequently since 2007 and up until now nothing out of the ordinary has cropped up. On Saturday I was fortunate to ring six Red-billed Quelea, I know that these birds have been seen more and more frequently in the Western Cape and the Karoo but up until now I haven't spotted them on the southern side of the Outeniqua Mountain range. As you all know we are having the worst drought in 130 years, so one wonders if these dryer conditions are more attractive or there are any other factors which are influencing this movement of the species. It will be interesting to see if they stick around when we do finally get our much needed rain." In targetting weavers to study their movements, other birds are also caught. 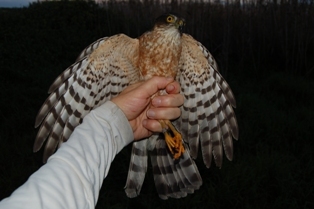 This morning a Rufous-chested Sparrowhawk (probably a sub-adult female) flew into my mist net at dawn in Kommetjie. There is a large roost with mainly Cape Weavers and some Southern Masked Weavers. When the sparrowhawk flew past, the weavers stopped their morning chorus. While ringing the sparrowhawk, the weavers quickly left the roost in some large flocks and later in smaller flocks. The Rufous-chested Sparrowhawk has been recorded catching weavers as prey, including Cape and Southern Masked Weavers. Thus the weaver chicks that have been ringed on the Peninsula are potential prey of this small raptor. Several weaver chicks have been recaptured at this site: read more about this project here. The captured sparrowhawk did not catch any early weavers, but nor did I on this session! Abstract. The bird collection housed in Lubango, Angola, contains more than 40,000 skins, representing more than 850 taxa. As part of an atlas project for Angolan birds, we visited the skin collection for two weeks in June 2008, to extract distributional information from the specimens. The skin collection is still in good condition, and the Instituto Superior da Ciências e Educação (ISCED), which houses the collection, is to be commended for this. Data from labels of 15,000 skins were entered into an electronic database, including all specimens of lesser known species. The remaining 25,000 entries are being made from photographs of ‘catalogue’ cards. The most interesting specimens are four Slaty Egrets Egretta vinaceigula, the first records of this globally Vulnerable species in Angola. Other examples of interesting skins are illustrated in various photographs, drawing attention to the importance of the collection for systematic studies. A brief mention is also made of the mammal collection. Finally, a list of recommendations is given for the future management of the collection. This week BirdLife Eastern Cape is celebrating their 60th anniversary. One of the events is a ringing course organised by ringer Albert Schultz. So far about 300 birds have been caught. The most common birds caught so far were Cape Bulbul, Lesser Swamp Warbler, Bar-throated Apalis, Common Waxbill, Sombre Greenbul and Southern Masked Weaver. 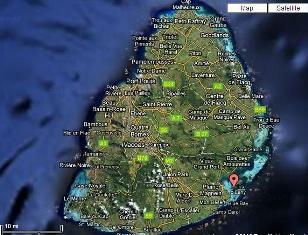 Ringing sites were mostly at Cape Recife, and also at Settlers Park, The Island Forest and Thunzi Lodge. Southern Masked Weaver males had black bills and red eyes and some started moulting into black feathers on the mask. Cape Weavers and Southern Red Bishops were also caught. 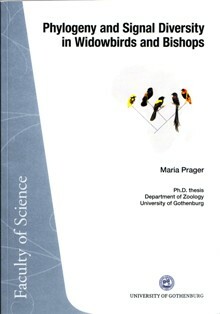 Maria Prager completed her PhD in animal ecology, entitled "Phylogeny and Signal Diversity in Widowbirds and Bishops (Euplectes spp. )", at the University of Gothenburg, Göteborg, Sweden. Her thesis contains an overview and five papers (four published, one provisionally accepted). Maria defended her thesis on 12 March 2010. This website shows current distribution maps of African birds and how these distributions may change due to climate by 2025, 2055 and 2085. 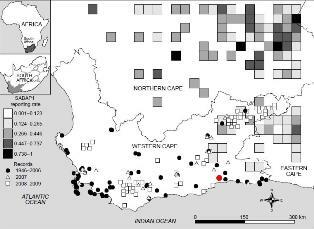 Many current maps have dots where the species does not occur (eg White-winged Widow does not occur in Cape Town). Many weavers are predicted to arrive along the east coast of South Africa in the future, although there is a wide gap between the rest of the bird's future range - this modelling does not seem believable. Some examples of this are Ploceus baglafecht, Ploceus angolensis, Ploceus nigricollis, Ploceus rubiginosus, Ploceus superciliosus, Malimbus malimbicus, Euplectes diadematus and Ploceus taeniopterus. Interestingly Red-headed Weavers and Red-billed Buffalo Weavers are predicted to arrive in Cape Town even though these are savanna species. Species will certainly change their ranges in the future but any long term predictions are unlikely to be correct since range changes depend on more than future environments, but also ecological interactions (like diet). Abstract. SAFRING ringing data was used to investigate the differences in the timing and duration of primary wing moult between males and females of sexually dimorphic passerines from the Western Cape, South Africa. In the sunbirds, weavers and canaries that were considered, the males generally started moult before the females, whereas this was not so for other species. In the species where males started moult before the females, the standard deviation of the start of moult was generally smaller in the males and the males generally took longer to moult. These differences in the patterns of moult are discussed in the context of differences in parental care between males and females of each species and within their taxonomic groups. Cape Weaver, Southern Red Bishop and Yellow Bishop males started moult 1 to 3 weeks earlier than females and males took longer to moult. Southern Masked Weaver males started a week later than females, but this difference was not significant. There is a post for a biologist interested in doing a PhD in animal ecology, entitled "Colour signalling and adaptive radiation in African weaverbirds", at the University of Gothenburg, Göteborg, Sweden. The PhD-position starts in June 2010 (or as agreed upon) and the application deadline is 30 April 2010. The main supervisor is Prof. Staffan Andersson who has a spectacular study site at the epicentre of Euplectes diversification in Tanzania. Application details are available here. The period 11-21 March saw successful days of ringing and bird talks. At Barberspan Bird Sanctuary 1610 birds were handled of 82 species. Birds not ringed at Barberspan previously were Darter (10 chicks), Cloud Cisticola, and Crimson-breasted Shrike. 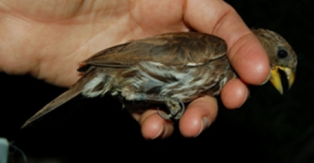 Of the retraps already reported, the greatest elapsed time was for 2 White-browed Sparrow-weavers ringed in June 2008. Top species caught were Southern Red Bishop (743), Red-billed Quelea (183), Southern Masked-Weaver (128), Kittlitz's Plover (70), and Egyptian Goose (38). 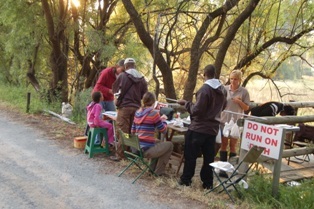 About 300 birds were ringed at Wakkerstroom over 2 days to demonstrate ringing to birders attending the BLSA AGM. Ringers Rina Pretorius, Sylva Francis (with trainee Michael), Yahkat Barshep and Doug Harebottle helped with the ringing. The retrap with the greatest elapsed time was a Southern Red Bishop ringed on 07/01/2005. Brief reports of these events may be seen as a web report and SAFRING news items. Most resident passerines on the Cape Peninsula seem to move very little, based on ringing several thousand birds over several years. The exceptions are nectarivores and Cape Weavers, all of which show extensive movements, probably in relation to food supplies. A map of Cape Weaver movements has lines linking the top left corner of the grids (and not actual points of capture) where the weavers were caught and recaptured. 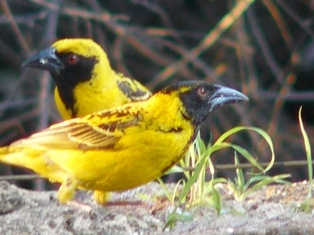 The Baglafecht Weaver has 8 distinct races, some of which have been considered separate species. Some races have an eclipse plumage while others retain the same plumage all year. All or most races intergrade. Usually the eye is pale and it has a black face, but the headand back colours vary (young birds probably all have dark eyes and paler faces). The species is found from central to East Africa, and is a monogamous breeder. A variety of plumages is illustrated from Rwanda and Kenya here. This project is continuing to progres well and has been running for 5 months. The study aims to estimate survival rates of weavers in different parts of southern Africa, and relies on ringers ringing and recapturing weavers. The most ringed weaver species is now the Southern Masked Weaver (985) although it has a low recapture rate (5.6%). 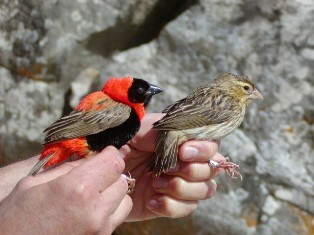 In second place is the Southern Red Bishop (820 ringed). 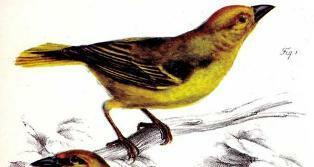 The Spectacled Weaver has the highest recapture rate (36%). Read more here. Catching weavers results in also catching other birds, and in wetland areas that may mean waterbirds! See photos of the waterbirds here. From January there is frequent ringing in order to recapture chicks ringed last year. The first 3 weeks of January have yielded 152 birds, of which 64 were weavers. Of these 4 were juvenile weavers that had been ringed as chicks near the site of recapture. 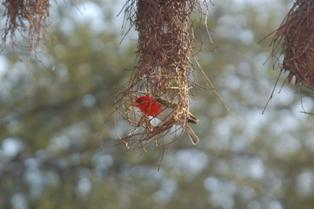 One juvenile was a Southern Red Bishop, and the other 3 were Southern Masked Weaver chicks. The latter were all from the same nest and were caught with an adult female - they were seen flying into the net at the same time, indicating that the juveniles (3 weeks old) were still dependent on their mother. Abstract. Males in many bird species develop elaborate carotenoid-based plumage ornaments that play an important role as signals of individual quality in intra- or intersexual selection. In the present study, we investigated which of several factors related to male condition and health affect the brightness and coloration of the carotenoid-based orange-red breeding plumage in males of the red bishop (Euplectes orix), a polygynous and sexually dimorphic weaverbird species. The study revealed a very complex pattern, with the relationships between plumage traits and both heterophil-to-lymphocyte ratio and blood parasite load varying considerably among seasons, suggesting a strong influence of environmental conditions. Furthermore, overall condition of males strongly affected the association pattern between plumage traits and other factors, with males in bad condition being forced to allocate resources away from plumage elaboration to body maintenance or the enhancement of immune functions, whereas males in good condition can afford to invest in plumage ornamentation without obvious detrimental effects on health. Thus, females cannot rely on plumage characteristics alone to gather information on male quality, but have to assess additional traits that advertise general male health status. Perhaps surprisingly, testosterone levels were not related to male plumage characteristics. "Camping for a weeks in Maun, Botswana, November 2009, in a Mopane forest, my closest neighbours, 50 cm above my roof tent, were 3 inhabited nests with Red-headed Weavers (Anaplectes rubriceps). Other neighbours nearby were a colony of at least 50 breeding pairs of Red-billed Buffalo-Weavers (Bubalornis niger), 2 pairs of Lilac-breasted Rollers (Coracias caudatus) and at least 2 pairs of Broad-billed Rollers (Eurystomus glaucurus). Late afternoon, the 3rd day, the Red-headed Weaver nests were attacked by 2 Gabar Goshawks (Melierax gabar), a smallish grey morph male and a dark black, almost double-sized, female. The Red-headed Weaver adults were silent and stayed at home, while the 2 birds of prey hung on the nests tearing them apart. However, to the rescue of the small weavers, came the much larger Red-billed buffalo Weavers, as well as the 2 roller species, birds that were continuously fighting over nest holes and territories the previous and coming days. This massive defence force proved to be too much for the goshawks, taking to the wings, not attempting more attacks." This short note corrects an error in the published catalogue of avian types in the Transvaal Museum (Dean WRJ 2007, Type specimens of birds (Aves) in the Transvaal Museum collection, Annals of the Transvaal Museum 44: 67-121). The holotype for Yellow Bishop Euplectes capensis macrorhynchus is specimen TM 11811, and TM 11810 is a paratype, both from Klawer near Vanrhynsdorp, in the Western Cape, and collected by Austin Roberts in September 1917. A one day ringing visit to Landela (Cloughside farm), between Port Elizabeth and Uitenhage, resulted in the recapture of Dark-backed Weaver BH34002, a female first ringed by Mike Ford on 11/10/2004 at the farm. It was recaptured on 16/11/2005 during a SAFRING national ringing workshop Landela. BH34002 was caught again, this time with a juvenile, on 06/01/2010 (Thanks to Eugene & Renee Cooney for their hospitality!). The elapsed time was 5 years 3 months, making it the greatest longevity for this species in the wild. 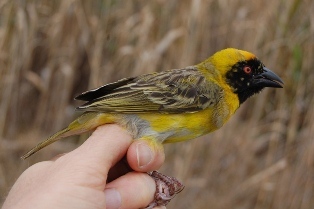 The Dark-backed Weaver may be expected to achieve much higher longevities, however, as relatively few have been ringed in Africa to date. It has reached 10 years in captivity. More longevity records for weavers are given here. Over 2000 birds were ringed on the Cape Peninsula in 2009, of 40 species. Two thirds of these consisted of four weaver species. The top four species ringed were Cape Weaver, Southern Masked Weaver, Southern Red Bishop and Common Waxbill. The highest recapture rate (where at least 10 birds were ringed) was for Levaillant's Cisticola. A full species list of captures on the Cape Peninsula is given here. To join bird ringing events in Cape Town in 2010, check dates on this calendar. Abstract. The Red-billed Quelea Quelea quelea has been steadily expanding its range into the Western Cape province. The earliest record is of a vagrant in 1946. The next record came from 1986 in the Karoo and since 1997 there have been annual reports of the species in the province. It has become resident in the Karoo, especially in the Beaufort West to Leeu Gamka area. In April and May 2007 there was an invasion of Red-billed Queleas in the Western Cape province, particularly on the Cape Peninsula and Overberg region. Sixty-eight percent of records were within 5 km of the coast, over a stretch of 1 000 km of coastline. Adult males in breeding plumage were frequently observed, indicating that this irruption was not limited to post-juvenile dispersal. This influx was not repeated in 2008, but from April 2008 to January 2009, monthly records of queleas were higher than the combined monthly totals in years prior to the influx. The increasing occurrence of queleas in the Western Cape province is a potential threat to a major wheat-producing area and continued monitoring is required. Recent sightings are listed on the web here. Email author to request pdf of paper. Red-billed Quelea flies 1735 km just to be eaten! 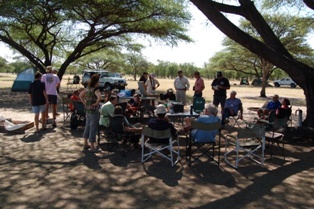 On 27 October 2009 a group of South Africans visited Rovuma Village near Balama, Cabo Delgado in Mozambique. They were part of a group of 4x4 enthusiasts on a 5 week venture. Late in the afternoon some local women were busy cooking and one of them brought a metal object to the South Africans. The metal ring had been found in one of the pots used for cooking soup, and was inscribed with a SAFRING number AM62067. This bird (Quelea quelea) had been ringed on 27 January 2007 as an adult female at Nokeng Buffelsdrif in Pretoria (25°35'S 28°20'E) by Chris du Plooy. The ring recovery was reported on 29 October 2009 from Rovuma Village (13°18'S 38°34'E) by Eric Dry. This bird moved 1735 km in 2 years 9 months. "In Kwazulu Natal, a pair of Lesser Masked Weavers have been discovered breeding at Mount Edgecombe Estate in Durban and were showing well on Monday. They were apparently only discovered at this site last year for the first time and are evidently an extremely rare bird in the Durban area with not a single record during the first bird atlas project." Extract from SA Rare Bird News Report - 26 November 2009 (David Allan). Further to David Allan's report, Garth Aiston was lucky enough to catch and ring seven non-breeding Lesser Masked Weavers together with Village, Brown-Throated and Yellow weavers at Umhlanga Ponds a few months ago. On Saturday 11 ringers and trainees gathered from 5am at Intaka Island, Cape Town, to ring birds. Attendees were Margaret McCall, Lee Silks, Phoebe Barnard, Jo Johnson, Eric Barnes, Cassy Sheasby, Carol Milan, Damian & Calvin Gibbs, Dieter & Tandy Oschadleus. A total of 192 birds were caught, not counting same-day recaptures, of 19 species. The top 3 species caught were Cape White-eye (49), Southern Red Bishop (47), and European Starling (25, mostly juveniles!). Some photos may be viewed here. In addition to a wonderful ringing event that was enjoyed by all, the ringing helped a project on natal dispersal. Eight juveniles were recaptured that had been ringed as chicks. These were one Cape Reed (Lesser Swamp) Warbler, one Southern Masked Weaver and 6 Southern Red Bishops. All these juveniles had been ringed at Intaka 2 weeks to 2 months previously. 192 chicks have been ringed at Intaka so far (11 Cape Reed Warbler, 18 Cape Weaver, 57 Southern Masked Weaver, 106 Southern Red Bishop) and it is expected that some of these will be recaptured away from Intaka in the months to come. Thanks to Alan Liebenberg for allowing the ringing event to be held at Intaka. The 2009-2010 Kirstenbosch Summer Sunset Concert Series starts on 22 November 2009, and various environmental organisations will exhibit their projects at these concerts, culminating in the main Biodiversity Expo on 25-28 March 2010. The Animal Demography Unit (ADU) will be exhibiting several projects on 22 Nov at the first concert for this season. Come early to the concert by Johnny Clegg and see the ADU displays, including a Ringing demonstration and weaver nests display. Read more about the Concerts and Biodiversity Expo here. This project is progressing well, after just 2 months. The study aims to estimate survival rates of weavers in different parts of southern Africa, and relies on ringers ringing and recapturing weavers. The most ringed weaver species is the Southern Red Bishop (169) and it also has the highest recapture rate (15%). Other species with over 100 ringed are Cape Weaver and Southern Masked Weaver. Read more here. Christian will help ring weaver chicks for the project on natal dispersal, a project to see how far weaver chicks disperse after fledging. Over 250 chicks have been ringed in the last 2 months. During August and September 2009 over 200 weaver chicks were ringed in an on-going project to ring chicks and later recapture as many of them as possible to determine their natal dispersal. Three Southern Red Bishop chicks were ringed at Intaka Island (Century City) on 04/09/2009 about a week prior to them fledging. One of these fledglings was killed by a cat in a nearby garden on 30/09/2009, about 1km from the nest site. It was reported by Sally Terry who had earlier noticed that the fledgling was still being fed by an adult Southern Red Bishop. One Southern Masked Weaver chick was ringed at the Kenilworth Race Course on 23/08/2009 when it was close to fledging. It was recaptured a little over a month later on 02/10/2009 in a small roost in a patch of reeds 1/2km from the nest. These are the first 2 records of movements of chicks ringed in 2009. Many more chicks will be ringed and mist-netting sessions in 2010 will attempt to recapture surviving birds. Keep track of total number of chicks ringed by reading more here. Several papers about weaver identification, ageing & sexing have been published in Safring News. Many of them can be downloaded here as pdf files (the rest of the pdfs will be added soon). Abstract. The Lake Lufira Weaver Ploceus ruweti, known previously solely from the holotype collected at Lake Lufira (= Lake Tshangalele) in Katanga, south-eastern Democratic Republic of Congo (Congo-Kinshasa), in 1960, was rediscovered nesting at the same locality in February - March 2009. In this paper colour photos are provided of adult birds, a juvenile, the nest and eggs, and habitat of the species. Download the paper here. 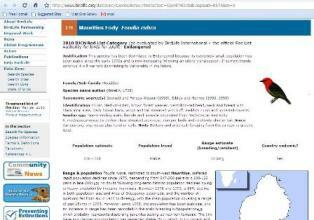 Specimen data from from northern Mozambique (north of 18°S) from 23 museums are included. The paper gives localities with 15°x15° grid and month of collection for each species - year of collection is not provided. The weavers with specimen data (23 species) are: White-browed Sparrow-Weaver, Lesser Masked Weaver, Spectacled Weaver, Yellow Weaver, Bertram's Weaver, Holub's Golden Weaver, Southern Brown-throated Weaver, Southern Masked Weaver, Village Weaver, Dark-backed Weaver, Olive-headed Weaver, Red-headed Weaver, Red-headed Quelea, Red-billed Quelea, Zanzibar Bishop, Fire-crowned Bishop, Southern Red Bishop, Yellow Bishop, Fan-tailed Widowbird, Yellow-backed Widowbird, White-winged Widowbird, Red-collared Widowbird, and Thick-billed Weaver. A new study has been launched to ring weavers in a way to maximise data for geographic variation in survival rates. Weavers are fairly easy to catch in large numbers, making them ideal candidates for large-scale studies. Species that could work well include Southern Red Bishops and Southern Masked Weavers. The key is to ring at sites where weavers are often recaptured. Ringers are able to contribute to this project in their normal ringing sessions. Read more here. Several weaver colony counts have been added to the web, all relating to colonies along national roads in the Western Cape. When on holiday, stop at one of these sites, count the nests and send in the totals! More colonies will be added in the future, or send colony details that you know about. Read more here. School children always need ideas for educational projects. Birds make wonderful subjects for many different projects, and one group of birds - the weavers - allow many different biological ideas to be explored. For the first time, some basic information about weavers is presented specifically with school projects in mind. See here. Each species now also has a nest or colony photo, sometimes with details of a specific well-known colony. Also two maps are shown for southern Africa: one of ringing sites and movements, and one of SABAP1 (atlas) records. These features are in addition to the headings already present, i.e. brief taxonomic history, the first illustration of the weaver species (a unique feature in itself! ), and a brief section on identification. See list of weavers and click on one. 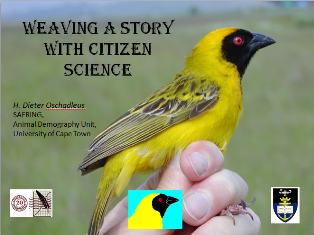 Talk: Any Cape Weavers home? Dieter Oschadleus presented a talk on Cape Weavers to the West Coast Bird Club on 30 May 2009. The bird club meets at Windstone farm, a farm that has a backpackers, riding centre, boarding kennels & cattery and is wanting to develop an educational centre. 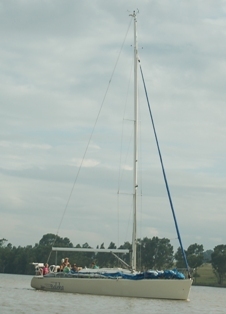 The West Coast Bird Club is a branch of BirdLife South Africa and is part of the flamingo route. We were hosted by Bill and Anna Dernier of Sandvelder B&B**** in Velddrif. Anna is chair of the West Coast Bird Club. On 31 May we ringed birds in their garden inbetween some drizzle, ringing 1 Southern Masked Weaver, 5 Cape Weavers and 8 other birds. A summary of this talk was written by Jackie During and posted here. 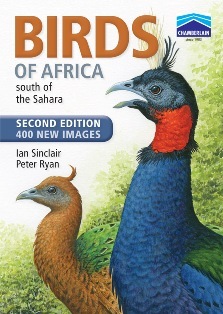 Several bird atlasses have been published in Africa, particularly covering southern and eastern Africa, and some countries in West Africa. These bird atlasses are listed here, with a map showing the countries covered. Abstract. The importance of the rainforests on the island of Sa˜ o Tome´ for biodiversity is well known. However, the area only recently received full legal protection as a National Park and currently few resources are available to enforce that legislation. With rapid economic development forecast for the island, active conservation efforts are essential. Here we study the distribution and density of the island's endemic bird species, including nine that are Globally Threatened, within the National Park. Sites, covering the full range of primary forest types, were surveyed using distance sampling methods. No introduced species were observed. The highest number of species, including eight Globally Threatened species, were found in lowland rainforest, although many were infrequently encountered. Higher altitude sites were less diverse, but supported some of the common endemic species at extremely high densities. The least diverse assemblage, with generally lower species population densities, occurred at the most accessible mid-altitude forest site. Distance from settlements was a key explanatory variable for the presence of all Globally Threatened species, indicating that human habitation has negative effects on the suitability of nearby forest habitats. This suggests that, as infrastructure improvements proceed, populations of endangered species will come under growing pressure. Integrating the needs of biodiversity conservation and development represents a major challenge for many biodiverse countries and on Sa˜o Tome´, as elsewhere, may best be achieved by preserving the still intact functioning forest ecosystem. The authors studied the distribution and density of the island's endemic bird species in the National Park (forest habitats), providing the first quantitative information on the endemic avifauna of São Tomé. Two weavers are included, although the Giant Weaver Ploceus grandis was only recorded once in the surveys conducted from 12 December 2001 - 12 February 2002. The São Tomé Weaver Ploceus sanctithomae was seen more often, allowing an overall density of 7.35 birds/ha to be calculated. On 9 May 2009 Adrian Craig recaptured Cape Weaver BB74847 in Florence Street, Grahamstown. It was a male in almost full breeding plumage. It had been ringed by Adrian at the same site on 17 September 1995, as an adult male in breeding plumage. The elapsed time is 13y 7m 25d. 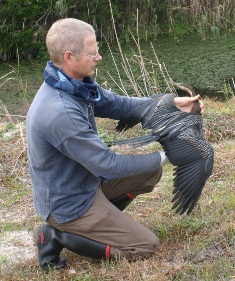 Adrian noted that the wing length and mass were nearly identical on recapture as at ringing. The previous longevity record for this species was 10y 4m 1d (CC12898). "Feathered locusts arrive in Cape" is the title of an article published by John Yeld in the Cape Argus on 24 April (p8), where the breeding event near Worcester and the potential impact is described . This was followed by more details on the problem of quelea in Africa in "Flying pests are breeding trouble", including comments by Sir Clive Elliott, in the Cape Argus on 29 April (p10). A breeding colony of the Red-billed Quelea has been found near Worcester. This is the first breeding record of the species in the winter rainfall region, a mere 120 km from Cape Town. The Red-billed Quelea did not occur in the Western Cape 25 years ago (although there was one vagrant record from 1946), and is already well established in the Beaufort West area. 1. This study investigates the mechanistic and ecological basis of phenotypic sorting in the sociable weaver Philetairus socius (Latham). In this colonially and communally breeding African bird, morphology, condition, age-specific survival rates and reproductive investment vary with colony size. 2. This variation might arise from non-adaptive constraints imposed by density dependence, or from adaptive life-history responses to colony size-dependent selection pressures. To attempt to distinguish these, the environments in which adults made reproductive decisions and in which offspring developed were manipulated. 3. When food supplementation improved the pre-breeding environment of adults, they bred earlier but did not change investment in eggs or incubation. 4. Nestling and subsequent adult phenotypes were unaffected by supplementary feeding, although post-fledging survival improved. Nestling origin and not rearing environment predicted phenotype in a cross-fostering experiment between colonies. 5. Phenotypic differences among colonies hence seemed not to be plastic responses to resource availability. Life-history differentiation, mediated either genetically or maternally, might have taken place over relatively narrow temporal and spatial scales. 6. Adaptive variation in reproductive investment could thus mitigate costs of large colony size, by reducing costs of reproduction and hence improving adult survival. If so, then fine-scale life-history adjustment could help to maintain stable variation in colony size.